topfactory has no other items for sale. I use to fuss about them. I will never go back to regular bulbs. They are great and for an excellent price. Differently recommend this product to anyone. I put them in all of our vehicles. Thanks Larry. I purchased these for my 04 Gmc Yukon. I switched out the Original Halogens. Only to be out the same nite and the new Leds were hardly bright enough to see. Luckily i had saved my old bulbs and was able to hit the gas station, and swap bach to my original Halogens. Would not recommend! 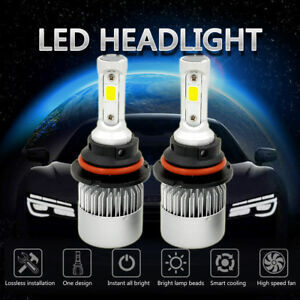 I read the Reviews AFTER I purchased these Headlights and had Cancelled the Order But Thankfully I Was Too Late and I have to say WOW, I'm Impressed!! I'm going to leave a couple of Photos and You'll be able to see for yourself the difference. I will be Recommending these to both Family and Friends!!! By the way, they'll be a Side by Side Comparison, the Passengers Side is the LED, the Driver's Side is the brand that came with the vehicle, I honestly don't know the brand so this might appear to be unfair. I'm just happy to have the ability to see Good at Night!! Well these headlights have dim and bright unlike some of the other economically priced LED headlights on eBay. They are not as bright as they claimed but they will certainly do the job for the 12 dollar price tag. Definitely a good value product so far.